Guest Blog: DB Jackson’s THIEFTAKER! I have in the past mentioned that one of the perks of my job is getting to read early manuscripts for upcoming books. 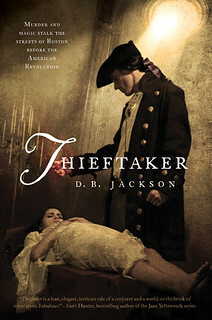 Last year my friend and fellow Magical Words blogger DB Jackson asked if I might read his novel THIEFTAKER, which turned out to be a Revolutionary War era urban fantasy novel. I don’t *normally* send people emails while I’m reading their books, but I sent David at least two or three during the course of reading THIEFTAKER, saying things like “ACK YOU DID WHAT HOLY *CRAP* DUDE!” and “OMG I did NOT see that coming ALGHGLH!! !” David said he’d never had anybody emailing him while reading, either, so the whole thing was an amusing and novel (er, so to speak) experience for both of us. Anyway, I loved what David had done, so I am now delighted to offer up a little five-question interview I did with him in celebration of THIEFTAKER’s release! Before the interview, let me give you a couple quick links: Sample chapters for THIEFTAKER, and David’s site, where all pertinent social network links can also be found. THIEFTAKER is available now! 1. I was lucky enough to get to read an advance copy of THIEFTAKER, which I utterly enjoyed. But you’ve gone out on something of a limb with it–it’s Revolutionary War urban fantasy. What made you decide to tackle urban fantasy set in a different era? This is a far more complicated question than you know — several forces conspired to lead me to this book and series. The original idea for THIEFTAKER came from, of all things, a footnote in a book about Australian history. The footnote discussed the vagaries of 18th century law enforcement in England, including the rise of thieftakers, who retrieved stolen items for a fee. In particular, it discussed London’s most famous thieftaker, Jonathan Wild, who used to have his henchmen steal goods which he would either sell for a profit or return for that finder’s fee. He built an empire for himself on this business model. Reading about him, I thought “What a great idea for a book!” I would have an honest thieftaker, who could conjure, but who had to deal with a Wild-like corrupt nemesis. So from the start this was going to be an urban fantasy, although not a contemporary one. In my first draft, THIEFTAKER was set in an alternate fantasy world. But when I talked to my editor about it, he suggested turning it into a historical fantasy and setting it in London. Now I should mention here that I have a Ph.D. in history — U.S. History. And my response to his suggestion was that I could see turning it into a historical, but not in London — everyone sets books in London. What if we set this in pre-Revolutionary War America? I had always been fascinated by the late colonial era, when the British Empire in the New World was coming apart at the seams. And given the lack of an established constabulary in the colonies, particularly in Boston, where the books take place, it made sense that thieftakers could have thrived in the colonies. So there it is — somewhat circuitous, and probably more than you wanted to know. But that’s how I got here. I am an avid photographer — an interest you and I share, if I’m not mistaken. And like you I would probably answer the question by saying that as a parent and a spouse, finding time for my photography is probably the least of my concerns! In all seriousness, though, I find that in order to be successful with my writing, and in order to keep myself sane, I have to find time to do other things. Each morning before I sit down to write I take time to do something active, something that forces me out of my chair, and away from my computer screen. Most days that involves going to the gym. But we live in a beautiful spot on the Cumberland Plateau, and so several times during the year I will go out to take photos. I’m particularly eager to get out with my camera in the spring when wildflowers are blooming, in the fall when the leaves are changing, and in the winter after a good snow. But the larger point is that making for time for such things is more than a matter of recreation. It keeps me healthy, and I think that ultimately it helps my art, not only by giving me a break, but by engaging a different part of my brain. I find creating an effective image satisfying in a way that is totally different from the satisfaction I get from writing a good scene in a story or book. On the other hand, the rush I have gotten from seeing my photos exhibited, or from making a photography sale, is quite similar to the thrill of selling a new book or seeing my novels on a bookstore shelf. That moment of seeing an act of creativity realized — consummated if you will — is pretty magical. I am what writers generally call a plotter (as opposed to a pantser — a person who writes by the seat of his or her pants). I tend to outline my books ahead of time, and almost always know as I begin a book how the story is going to end. But I don’t plot every plot-point — far from it. My outlines tend to be vague. I’ll write maybe a sentence or two for each fifteen page chapter. “Ethan goes to speak with Samuel Adams. They agree that Summer Ale is far superior to Boston Lager.” That’s it. The rest I let happen as I write. So I suppose I’m actually a plotter who has a bit of the pantser in him. I often compare my creative process to drinking a bottle of soda. When I drink a Coke, I don’t open the bottle more often than I have to, because I don’t want the Coke to lose its fizz. In the same way, I can’t write about, or talk about my story too much — and that includes outlining in too much detail. Because the more I do those things, the more fizz I let out. And eventually the story will go flat on me before I’ve had a chance to write it. I do listen to music when I write, but I’m very particular about what I listen to. I will only listen to instrumental music, and generally only bluegrass and jazz. I find that lyrics distract me. On the other hand, I find that the improvisational quality of bluegrass and jazz feeds my creative energy and keeps me moving through my narrative. Rough patches, as you know, have so many possible causes that it’s hard to generalize about how I handle them. I do find that when my narrative stalls on me, it’s usually because of something I’ve done earlier in the manuscript. Sometimes, I’ve allowed one plot thread to overwhelm the rest of the story. Or I’ve had a character do something that he or she would never do. Or I’ve used a plot twist that really doesn’t work. The point is that my own mistake has led me to a dead end. And so I will go back and read through what I’ve written thus far to identify the point where things started to go wrong. Generally, when I find that moment and correct the mistake, the book starts to flow more smoothly. As for my focus, that’s changed over the years. Used to be, I could only work on one project at any given time. Having my mind in two stories or worlds at once was more than I could handle — and all the works in question suffered. I’ve gotten over that and currently am working on not only the Thieftaker project, but three other novel length projects that are in vary stages of revision and/or re-conception. I actually have come to like working this way; I find that the more projects I have underway, the less likely I am to grow bored with any of them. A theme song for Ethan? Wow. Good question. I think I would go with “Gimme Shelter,” by the Rolling Stones. This is fairly dark book. Violence looms in every scene. War — in the form of the Revolution — is drawing closer. “War, children, it’s just a shot away…” There is literally fire in the streets. “Fire is sweeping our very street today…” And yet he also manages to find love in this climate, as the song does at its end. “Love, sister, it’s just a kiss away…” Yeah. I think “Gimme Shelter” works pretty well. 5. What’s your secret superpower, the one weird thing you can do that nobody else can? And if you got to have a *real* superpower, what would it be? I’m not sure that I have a superpower. I mean, I make a mean vegetarian fajita. And I’m really good with a grilled pork loin, too. I skip stones on water very, very well. Oh, wait. I know, but I’m reluctant to reveal this because it will tell people just exactly how much of a nerd I am. I’m a birdwatcher, and I am incredibly good at identifying birds by their songs, particularly the birds here in the Southeastern U.S. where I live. I can basically pick out a song and know exactly what bird it is. Let the abuse begin . . .
As for the *real* superpower, do you mean which would would I be most likely to have, or which one would I really like to have? I would really like to be able to make myself invisible and go wherever I want whenever I want. I think that would be very cool. Although I have to admit that as I get older I often think that the best superpower would be to be able to eat anything I want without consequences. But if you were talking about which superpower I would be most likely to have if such things were dispensed at birth as a matter of course, it would probably be something totally prosaic and useless. Like, perhaps, being able to identify any bird by its song . . .
Hope you enjoy it, Michele. Thanks for your interest.